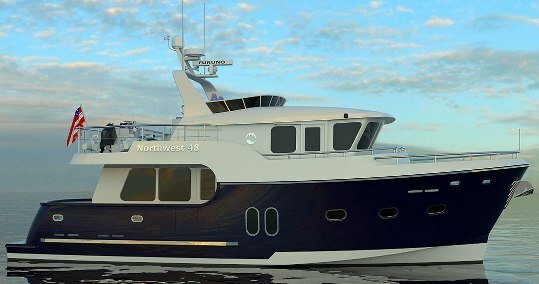 Northwest has in 2016 embarked on a project of totally revamping its line of explorer cruisers and yachts. 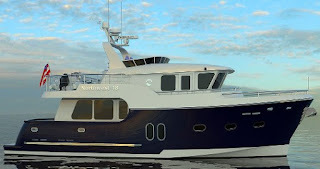 The Northwest 48 is a semi-displacement hulled explorer trawler cruiser featuring two staterooms and two heads. The master stateroom has a queen sized berth and is located at midships, while the guest cabin is to fore and can either be crossed over/under bunks or a queen berth. For the crossed over/under bunk version, the lower bunk may be fitted with a slide out for sleeping two. Due to the unique hull design, standing headroom is found in the engine compartment, something not found on many semi-displacement hulled boats in this size range. Power is from twin John Deere 330hp engines with line shaft propulsion.